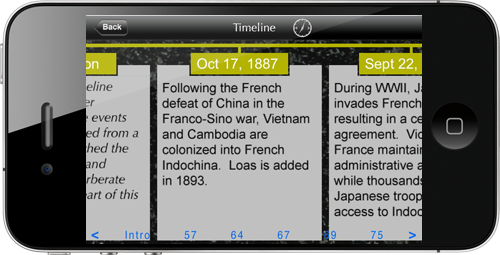 The "Timeline" offers a brief, chronological introduction to the War in Vietnam. It's pretty straight-forward. You can scroll though the Timeline, date-by-date, or can quick-jump to different sections by selecting from the dates at the bottom of the screen. Arrows also enable you to progress, panel-by-panel, forward or backward in time.